Jeffery may draw less attention from opposing defensive backs after the Eagles acquired slot specialist Golden Tate from the Lions on Tuesday, Graham Foley of the Eagles' official site reports. Jeffery caught four of five targets for 35 yards in Sunday's 24-18 win over the Jaguars. Jeffery caught seven of 10 targets for 88 yards and a touchdown during Sunday's 21-17 loss to the Panthers. Jeffery brought in eight of 12 targets for 74 yards and two touchdowns in the Eagles' 34-13 win over the Giants on Thursday. Jeffery caught two of eight targets for 39 yards in Sunday's 23-21 loss to the Vikings. Analysis: Jeffery garnered plenty of attention from standout cornerback Xavier Rhodes on the day and was rarely able to break free aside from a 31-yard gain in the third quarter. The veteran enjoyed an excellent season debut last week when he torched the Titans, so it seems this dud could merely be attributed to a tough matchup. As such, Jeffery could be considered a bounce-back candidate Thursday against the Giants. Jeffery (chest) was a full participant in Thursday's practice. Jeffery (chest) was on the field for the start of Thursday's practice, Dave Zangaro of NBC Sports Philadelphia reports. Jeffery was listed as a non-participant at Wednesday's practice due to a chest injury, Zack Rosenblatt of NJ.com reports. Jeffery wasn't spotted at the portion of Wednesday's practice open to the media, Dave Zangaro of NBC Sports Philadelphia reports. Jeffery caught eight of nine targets for 105 yards and a touchdown during Sunday's 26-23 loss to the Titans. Jeffery (illness) is listed as active Sunday in Tennessee, Tim McManus of ESPN.com reports. Analysis: An illness rather than his surgically repaired right shoulder was the chief concern for the cloud hanging over Jeffery's availability. With the first one diminished and the latter holding up in his sole practice of Week 4 prep Wednesday, he'll reenter the Eagles' lineup for the first time since Super Bowl LII. Jeffery may be hard-pressed to resume his role as Carson Wentz's No. 1 target off the bat, especially with Nelson Agholor, Zach Ertz and capable pass-catching running backs also available. Jeffery (illness/shoulder), who had been viewed as a game-time decision for Sunday's game against the Titans, will play barring a setback in pregame warmups, Chris Mortensen of ESPN reports. Jeffery (shoulder/illness), who is listed as questionable for Sunday's game against the Titans, will be a game-time decision, Ian Rapoport of NFL Network reports. Jeffery (shoulder, illness) is listed as questionable for Sunday's game in Tennessee, Daniel Gallen of PennLive.com reports. Jeffery (shoulder) is still dealing with an illness, but head coach Doug Pederson indicated he still has a chance to make his season debut Sunday against the Titans, according to Eliot Shorr-Parks of Sports Radio 94 WIP Philadelphia. Analysis: Jeffery sat out Thursday's practice and will do the same Friday, according to Jeff McLane of The Philadelphia Inquirer, but Pederson did not rule him out for Week 4 prior to Friday's session, so he still has a chance to play. The Eagles will reveal Jeffery's official status for Sunday's contest after Friday's practice comes to a close. Jeffery (shoulder) didn't participate in Thursday's practice due to an illness. Jeffery (shoulder) wasn't present for individual drills at Thursday's practice, Mike Kaye of FirstCoastNews.com reports. Analysis: After gaining clearance to take contact and practicing in full Wednesday, Jeffery's absence one day later is an ominous sign for the health of his right shoulder. Until the Eagles release an injury report, though, there's no telling if the shoulder or something else was the reason for his potential DNP. Jeffery (shoulder) was a full participant at practice Wednesday, Jeff McLane of The Philadelphia Inquirer reports. Analysis: This shouldn't come as much of a surprise after coach Doug Pederson announced earlier in the day that Jeffery finally gained clearance to take contact in practice. 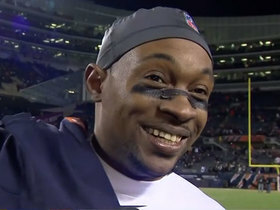 Listed as a limited participant the past few weeks, the 28-year-old has now taken a big step forward and may gain clearance to play in Sunday's game at Tennessee. He'll be a risky option for fantasy owners if he ends up playing, as the Eagles are unlikely to give Jeffery his usual snap count right out of the gate. Eagles head coach Doug Pederson said Wednesday that Jeffery (shoulder) has been cleared to take contact during practices, Eliot Shorr-Parks of Sports Radio 94 WIP Philadelphia reports. Coach Doug Pederson said Monday that Jeffery (shoulder) still hasn't been cleared for contact, Martin Frank of The Delaware News Journal reports. Analysis: Despite being listed as questionable for Sunday's win over Indianapolis, the veteran wide receiver never seemed to have much chance at playing. Jeffery could make it back for Week 4 in Tennessee, though he'll presumably need to be cleared for contact before he can increase his practice participation from 'limited' to 'full'. Pederson said Jeffery is "getting close" and should be able to do more work in practice this week, per Frank. Jeffery (shoulder) is inactive for Sunday's game against the Colts. Jeffery (shoulder), who is listed as questionable on the official injury report, is not expected to play Sunday against the Colts, Adam Schefter of ESPN reports. Analysis: Jeffery could return next week, according to the report. Still, this report isn't official and fantasy owners will want to confirm Jeffery's status before Sunday's 1:00 PM ET kickoff. Jeffery (shoulder) is listed as questionable for Sunday's game against the Colts. Analysis: Per Martin Frank of The Delaware News Journal, Jeffery was listed as a limited practice participant Friday. Previous reports noted the wideout has yet to be cleared for contact, which suggests that he's probably on the less favorable side of questionable heading into the weekend. Still, given that he's not been ruled out at this stage, Jeffery's status remains worth monitoring as Sunday's 1:00 PM ET kickoff approaches. Head coach Doug Pederson said Friday morning that Jeffery (shoulder) still has not been cleared for contact, according to Zack Rosenblatt of NJ.com, indicating he will not play Week 3. Analysis: Jeffery has been able to practice on a limited basis this week, but until he is cleared to play by the team's medical staff, he will remain sidelined with his shoulder injury. Whenever Jeffery is ultimately given the green light medically, his season debut will likely follow shortly thereafter. Jeffery (shoulder) turned in a limited practice Thursday, Adam Caplan of SiriusXM Radio reports. Jeffery (shoulder) was listed as a limited participant on Wednesday's injury report, Jimmy Kempski of PhillyVoice.com reports. Analysis: Jeffery was also a limited participant throughout last week and never had any real chance to suit up for Sunday's 27-21 loss to the Buccaneers. He still hasn't been cleared for contact, but head coach Doug Pederson did say he expects the wideout to take a step forward in his rehab process this week. Jeffery still seems likely to miss at least one more game, with Nelson Agholor tentatively in line to serve as the Eagles' No. 1 wideout Week 3 against the Colts. Eagles head coach Doug Pederson said Wednesday that he expects Jeffery to take a step forward with his rehab this week, Dave Zangaro of NBC Sports Philadelphia reports. "[Jeffery's] a lot like Carson [Wentz] was a couple weeks ago, being able to get back into the mix and do some 11-on-11 stuff. This will be a big week in that regard," Pederson said. Coach Doug Pederson noted Monday that Jeffery (shoulder) is week-to-week, Martin Frank of The Delaware News Journal reports. Analysis: Jeffery was able to practice in a limited fashion last week, but by being dubbed week-to-week, it appears as though a Week 3 return might not be in cards for the wideout. 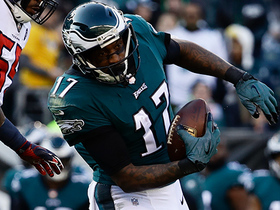 Meanwhile, Mike Wallace is sidelined indefinitely with a fractured fibula, so if Jeffery remains out Sunday against the Colts, QB Carson Wentz will be throwing to a depleted pass-catching unit in his first start of the season. Head coach Doug Pederson said Friday morning that Jeffery (shoulder) has not yet been cleared for contact, and thus will not play this week, Dave Zangaro of NBC Sports Philadelphia reports. Analysis: Jeffery was able to get in limited practices Wednesday and Thursday, and there's a good chance he will be able to get in some work Friday as well. However, because team doctors have not yet cleared him to take hits, he will miss a second straight game to begin the season. Jeffery's progress this week will give him a chance to make his debut Week 3, however. Nelson Agholor and Mike Wallace will be the Eagles' top two receivers Sunday against the Colts. Jeffery (shoulder) was limited at Thursday's practice, Adam Caplan of SiriusXM Radio reports. Analysis: For the second day in a row, Jeffery took part in individual drills, but that was the extent of his activity. He likely needs to progress to 11-on-11 drills and complete them without issue before given clearance for game action. 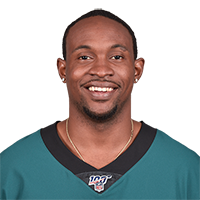 With one session remaining this week, the odds Jeffery makes his season debut Sunday in Tampa Bay are dwindling, which leaves Nelson Agholor and Mike Wallace at the top of the pecking order at wide receiver for the Eagles. Jeffery (shoulder) took part in individual work during the early portion of Thursday's practice, Martin Frank of The Delaware News Journal reports. Eagles head coach Doug Pederson said Wednesday that Jeffery (shoulder) has been cleared to participate in individual drills during practice this week, Martin Frank of The Delaware News Journal reports. Jeffery (shoulder) said he needs "a couple more visits with the doctor" before returning and is likely out for a few more weeks, Jenny Vrentas of Sports Illustrated reports. Analysis: Jeffery added, "Some days I feel great, and some days...a shoulder injury is pretty tough." Coach Doug Pederson previously suggested the additional time between Thursday's season opener and Week 2 could assist in a quick return to the field for the 28-year-old, but that now appears unlikely. Jeffery should still be considered week-to-week. Jeffery, who is recovering from rotator cuff surgery, will not play Thursday against the Falcons, the Eagles' official site reports. Analysis: Coach Doug Pederson referred to Jeffery on Tuesday as "week to week." 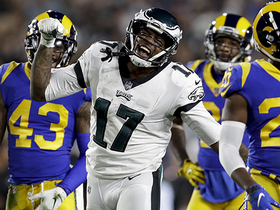 On the plus side, Pederson offered a degree of optimism that the extra time between Thursday's season opener and the team's Sept. 16 tilt against the Buccaneers could potentially provide enough time for Jeffery to return to action by Week 2. In Week 1 at least, QB Nick Foles figures to rely more heavily on tight end Zach Ertz, as well as wideouts Nelson Agholor and Mike Wallace. In advance of Thursday's season opener against the Falcons, coach Doug Pederson refers to Jeffery (shoulder) as "week-to-week," Les Bowen of the Philadelphia Daily News reports. Analysis: It remains to be seen if the Eagles simply rule Jeffery out for Week 1 or give him a "doubtful" injury tag. Either way, we'll operate under the assumption that he'll miss Thursday's contest, at a minimum. 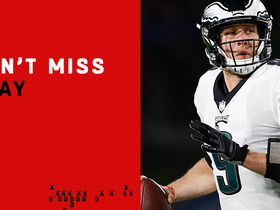 In his expected absence, look for QB Nick Foles to rely more heavily on tight end Zach Ertz, as well as wideouts Nelson Agholor and Mike Wallace, in the team's passing game. Jeffery (shoulder) passed his physical Friday and was activated off the PUP list, Zach Berman of The Philadelphia Inquirer reports. According to head coach Doug Pederson, Jeffery (shoulder) will be activated from the PUP list Friday and is day-to-day going forward, Zack Rosenblatt of NJ.com reports. Analysis: ESPN's Adam Schefter reported that Jeffery is expected to miss the first two weeks of the season, but Pederson's comment suggests the Eagles haven't entirely ruled out the possibility of an appearance before Week 3. In any case, Jeffery's activation from the PUP list means he won't be automatically ruled out for the first six weeks of the season. Nelson Agholor, Zach Ertz and Mike Wallace are the best bets to draw targets in Thursday's season opener against Atlanta. Jeffery (shoulder) is expected to sit out the first two games of the regular season, Adam Schefter of ESPN reports. Analysis: The Eagles are slated to activate Jeffery from the PUP list this weekend with the hope that he'll be available for Week 3 (Sunday, Sept. 23, against the Colts). Otherwise, if he remained on the list, he would be required to miss the first six games of the campaign. 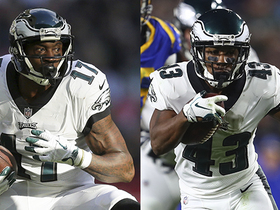 While Jeffery embarks on the final weeks of his rehab from February surgery on a torn rotator cuff in his right shoulder, the receiving corps will be led by Nelson Agholor, Zach Ertz, Mike Wallace and Corey Clement. Coach Doug Pederson said Tuesday that he still isn't sure if Jeffery (shoulder) will be available for the season opener Sept. 6 against Atlanta, Jeff McLane of The Philadelphia Inquirer reports. Jeffery (shoulder) worked on a side field with a helmet on during Monday's practice, Jeff McLane of The Philadelphia Inquirer reports. Analysis: The occasion marks Jeffery's first appearance on the field in any capacity since undergoing surgery to repair a torn rotator cuff in his right shoulder on Feb. 21. It's also serendipitous that he's present almost exactly six months removed from the procedure, which was the timetable given for his recovery. He remains on the PUP list, though, so he merely appears to be ramping up his conditioning with an eye on the regular season. In the end, it remains to be seen if he'll be healthy by Week 1. Eagles coach Doug Pederson said Tuesday that he's pleased with where Jeffery (shoulder) is at in his recovery process, Zack Rosenblatt of NJ.com reports. Jeffery (shoulder) could remain on the PUP list into the regular season, Ian Rapoport of NFL Network reports. Jeffery (shoulder) was placed on the Physically Unable to Perform list Thursday, Dave Spadaro of the Eagles' official site reports. Analysis: Jeffery's move to the PUP list at the outset of training camp was fully expected, as the wideout continues to recover from February surgery to address a torn rotator cuff in his right shoulder. The Eagles have provided no formal timeline for Jeffery's return to the field, but reports at the time of his surgery suggested a six-month rehab would likely be necessary. Jeffery (shoulder) didn't participate in the first round of OTAs and won't be available for any spring practices, Jimmy Kempski of Philly Voice reports. Jeffery (shoulder), who underwent shoulder surgery Wednesday, sustained a full tear of his rotator cuff and isn't certain to be ready for the regular season, Josina Anderson of ESPN reports. Analysis: Anderson notes that the expectation is for Jeffery to be ready for Week 1 but, now that the full extent of his injury is known, there appears to be concern he might not be. Furthermore, he's now said to be "very likely" to miss the preseason. Jeffery (shoulder), who underwent surgery Wednesday to repair a torn right rotator cuff, is uncertain to be available for the start of training camp and could miss time during the preseason, Les Bowen of the Philadelphia Daily News reports. Jeffery underwent successful surgery Wednesday to address a torn rotator cuff, Ian Rapoport of NFL Network reports. Jeffery brought in three of eight targets for 73 yards and a touchdown during the Eagles' 41-33 win over the Patriots in Super Bowl LII on Sunday. Jeffery caught all five of his targets for 85 yards and two touchdowns in Sunday's 38-7 NFC championship drubbing of the Vikings. Analysis: Jeffery hauled in a 53-yard score to make it 21-7 with 1:09 left before halftime, then caught a five-yard touchdown to conclude the scoring with 14:10 remaining in the fourth quarter. The physical wide receiver has established strong chemistry with quarterback Nick Foles, so expect Philadelphia to rely on Jeffery heavily in the Super Bowl. Jeffery caught four of five targets for 61 yards during Saturday's 15-10 win over the Falcons. Analysis: Jeffery led the team in receiving yardage on the day despite tying with three other players for the most targets. He averaged a healthy 15.3 yards per reception as each of his grabs went for a first down. Jeffery's value clearly took a hit when Carson Wentz went down with a season-ending injury, but he and Nick Foles appear to be building a respectable rapport ahead of next week's NFC championship game against the Saints or the Vikings. 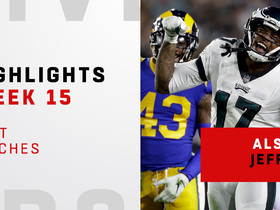 Jeffery and Nick Foles want to work on their chemistry during Sunday's game against the Cowboys, ESPN.com's Tim McManus reports. Analysis: While that may be true, Jeffery and Foles probably will need to make something happen in the first half, as the Eagles figure to start pulling key players before the end of Sunday's game. Jeffery was held without a catch on two targets in Monday's 19-10 win over the Raiders, after catching four of 10 targets for 49 yards and a score in Foles' first start Week 15 against the Giants. It'll be a surprise if Jeffery sees more than a handful of targets before exiting the regular-season finale. Jeffery was held without a catch on two targets in Monday's 19-10 win over the Raiders. Jeffery caught four of 10 targets for 49 yards and a touchdown during Sunday's 34-29 win over the Giants. Analysis: Jeffery reversed course in the back of the end zone during Sunday's game, turning back out toward the sideline for a three-yard score. The big-bodied target has now scored in six of his last seven games. He seems like a fair bet to keep humming so long as Nick Foles keeps slinging it like he did on Sunday. The Eagles' final two opponents, Oakland and Dallas, entered Week 15 both ranking in the bottom five of the league in opponent passer rating allowed. Jeffery (illness) was a full practice participant Friday and doesn't have a designation on the final injury report for Sunday's game against the Giants. Analysis: Jeffery only missed one day of practice and shouldn't have any limitations against a Giants secondary that likely will be missing standout safety Landon Collins (ankle). 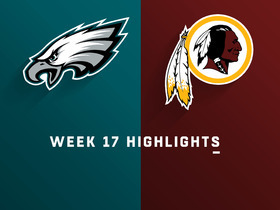 Of course, the favorable matchup is small consolation for the loss of Carson Wentz (knee). Jeffery (illness) took part in Friday's practice, Dave Zangaro of NBC Sports Philadelphia reports. Analysis: Jeffery sat out Thursday's session due to an illness, but he was feeling good enough to get back on the field one day later. As long as he is simply under the weather he should be good to go for Week 15, but the Eagles will clarify his status when they release Friday's injury report. Jeffery didn't practice Thursday due to an illness. Analysis: It remains to be seen if Jeffery's illness is a temporary concern, but there's a decent chance it follows him into the weekend. Ultimately, Friday's injury report will note his potential to play Sunday against the Giants, who conceded 56 yards on four catches (eight targets) to the veteran wideout Week 3. Jeffery caught five of 11 targets for 52 yards and a touchdown during Sunday's 43-35 win over the Rams. Jeffery caught four of six pass attempts for 61 yards in Sunday's 24-10 loss to the Seahawks. Jeffery and the Eagles agreed to a four-year, $52 million contract extension Saturday, Adam Schefter of ESPN reports. Jeffery (foot) was a full practice participant Thursday. Analysis: Jeffery's limited showing Wednesday was likely intended as maintenance due to a medical chart laden with lower-body concerns. With an uncapped session behind him, he'll set his sights on Sunday's matchup in Seattle, whose withered Legion of Boom has allowed 15.5 YPC and five touchdowns to wideouts over the last five games. Jeffery was a limited participant at Wednesday's practice due to a foot injury. Jeffery caught five of nine targets for 52 yards and a touchdown in Sunday's 31-3 win over the Bears. Analysis: Jeffery got off to a fast start but didn't catch any passes after halftime, as the Eagles leaned on their running game to kill the clock. 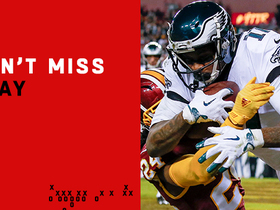 The pattern of quiet finishes is becoming familiar after four consecutive blowout victories, though it didn't stop Jeffery from scoring a touchdown and going over 50 yards in each of those games. He'll take aim at a banged-up Seattle secondary in a Week 13 road contest that should be more competitive than Philadelphia's recent matchups. Jeffery caught four of seven targets for 67 yards, one touchdown and one two-point conversion during Sunday's 37-9 victory over the Cowboys. Jeffery (ankle) is listed as active Sunday in Dallas, Tim McManus of ESPN.com reports. 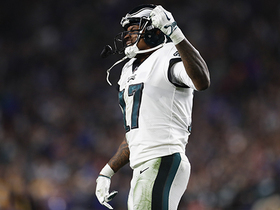 Analysis: Prior to wrapping up the week with a full practice, Jeffery told Dave Zangaro of NBC Sports Philadelphia on Thursday that he'd "most definitely" suit up this weekend. Indeed, Jeffery is available against a Cowboys defense that has conceded 8.7 YPT and 11 touchdowns to wide receivers across nine games on the season. Jeffery (ankle) is expected to play Sunday against the Cowboys, according to NFL Network's Ian Rapoport. Analysis: Jeffery is officially listed as questionable to play, though he was able to practice fully Friday. The ankle has apparently been an issue for a few weeks but hasn't been serious enough to list him on the injury report. The late start time for Sunday's game isn't overly helpful for fantasy owners needing to make a decision, but the optimism is certainly there that Jeffery will give it a go. Jeffery (ankle) was a full participant at Friday's practice and is listed as questionable for Sunday's game in Dallas, Dave Zangaro of NBC Sports Philadelphia reports. Jeffery (ankle) will be listed as questionable for Sunday's game against the Cowboys, but Eagles head coach Doug Pederson expects the wideout to take the field, Jeff McLane of The Philadelphia Inquirer reports. Analysis: Jeffery was limited at Thursday's practice with what Pederson referred to Friday as "a minor ankle issue that has been lingering for a while," but it appears the setback won't prevent the 27-year-old from taking the field in Week 11. Assuming Jeffery is listed as questionable for Sunday's contest as expected, a final call on his availability may not come until the Eagles' inactives are released about an hour and a half prior to the game's 8:30 p.m. EDT start time. Jeffery (ankle) said he would "most definitely" play Sunday against the Cowboys, Dave Zangaro of NBC Sports Philadelphia reports. Jeffery was a limited practice participant Thursday due to an ankle injury, Zach Berman of The Philadelphia Inquirer reports. Analysis: At the outset of drills, Jeffery was contained to work on the side, per Mike Garafolo of NFL Network, indicating the wideout was tending to an ailment of some sorts. With the nature of the injury known, the potential exists for Jeffery's route running to be compromised, assuming he takes the field Sunday night in Dallas. His availability for the game will receive some clarification upon the release of Friday's injury report. Jeffery snagged six of 11 targets for 84 yards and two touchdowns in Sunday's 51-23 win over Denver.